The process is compassionate, objective, and nonthreatening. We provide a safe haven for clients, so that they feel supported and empowered, allowing them to move forward and make the right decisions. We listen to each client's financial goals and incorporate those goals into a settlement proposal that is workable. Priority Planning helps each client understand the immediate and long-term consequences of settlement options. We also help clients work out a realistic budget and determine their actual and projected expenses. The above graph was created using Family Law Software, Inc. v 18.02 as a sample. 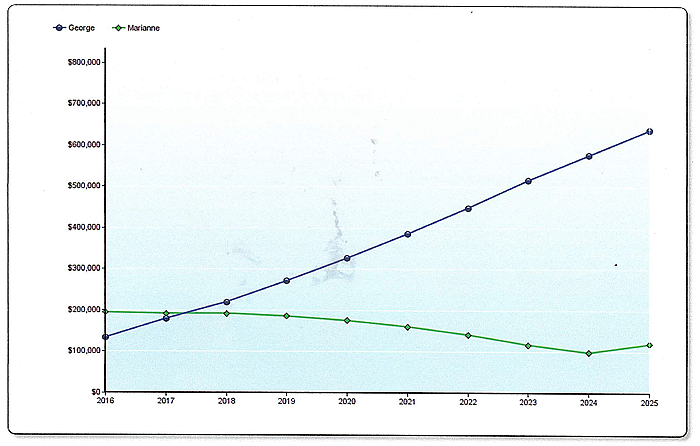 Notice the green line plotting the projected networth for Marianne shows a loss in value compared to the darker line plotting George's projected networth. The process also identifies further information that needs to be requested during discovery.